So when Mom and Big Sister went to Arizona to visit relatives and see the Grand Canyon for his sister's college spring break, my 12 year old son decided that he should get to go somewhere cool for *his* spring break. When I asked him where he wanted to go, he said he wanted to go trout fishing in the Black Hills. He didn't have to twist my arm much... I've loved the Hills since I was his age, and we went there on spring break two years ago, where he caught his first stream trout 'all by himself' on Rapid Creek. In the intervening two years he's really gotten into it, gradually moving from spinning gear to Tenkara to a regular fly rod. Up to now I'd kept trips short, and focused on easily accessible local streams. This was going to be his first real 'guy trip' - cheap hotel, no mom or sister with, nothing on the agenda but three solid days of fishing, and some pretty technical wading and fishing. We'd planned on leaving Tuesday the 3rd, but the weather forecast pushed that up a day as we tried to beat the snow out of town, and...yeah, that didn't work. 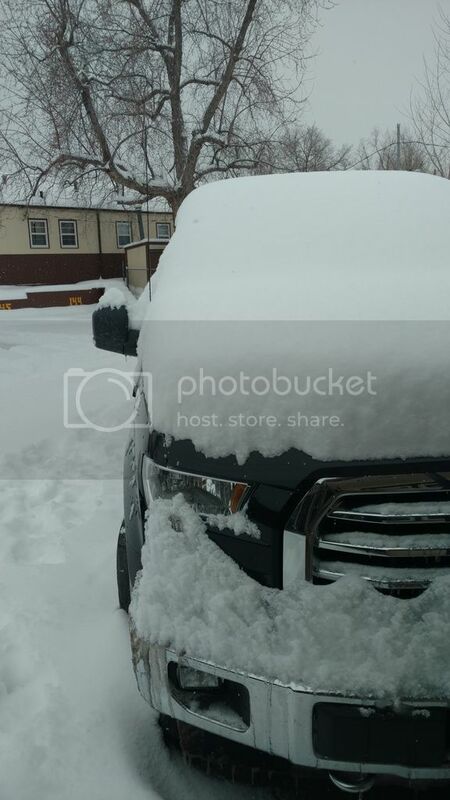 We stayed at a friend's in Sioux Falls and headed out Tuesday morning into a blizzard - patchy ice, 1/4 mile visibility 40 mph crosswinds (great fun in a pickup) and white knuckles. Great fun. 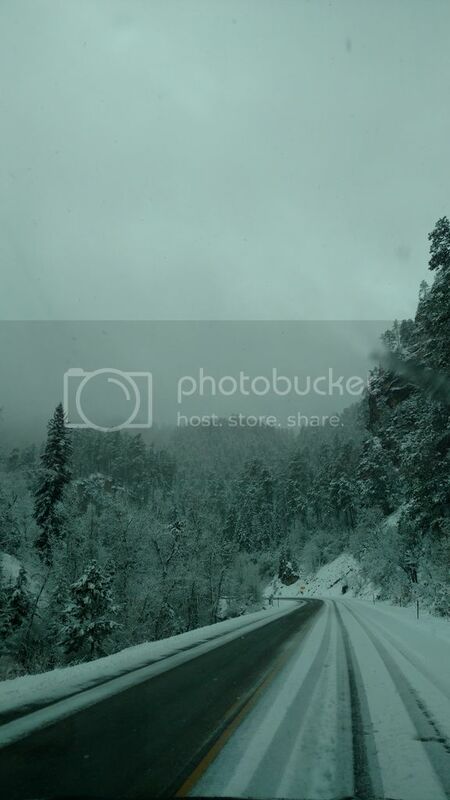 We finally made it to Spearfish, found our motel, and after getting settled in (which included lighting the pilot light for the heater in the motel room - that was a first) we headed out for a quick scout around and a drive up Spearfish Canyon. The upper canyon is some of my favorite water out there, but a lot of the stretches I like are on the west side of the canyon under the western rim, and probably hadn't seen the sun in months. 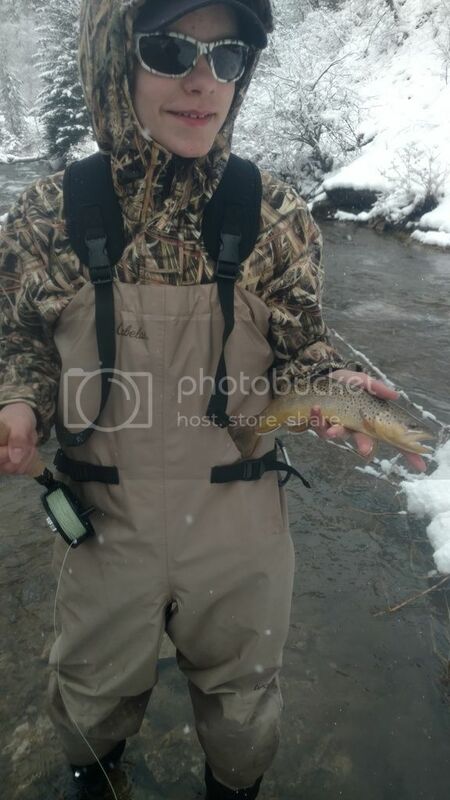 Between the snow and shelf ice on the banks, a lot of it was unfishable. After some poking around in the canyon we did find a few fish closer to town, but by then the temp was dropping, line and guides were freezing up, and we decided to call it a day. Day two was the opposite weather-wise. Bright, sunny, and beautiful. 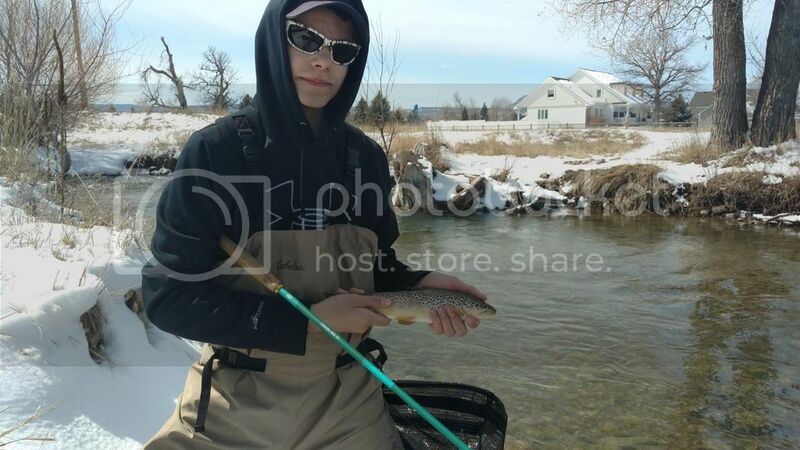 We headed to a stretch close to town, and Ethan decided to bring his Tenkara rod for the first stretch. Didn't take us long to get into them. I barely fished. Mostly just helped him and netted fish for him. But I did sneak in a cast or two here and there. After a few hours of sun, the stream in town started to chill down and get pretty full of debris from the runoff, so we headed up the canyon to try to get into a beaver pond with brook trout. 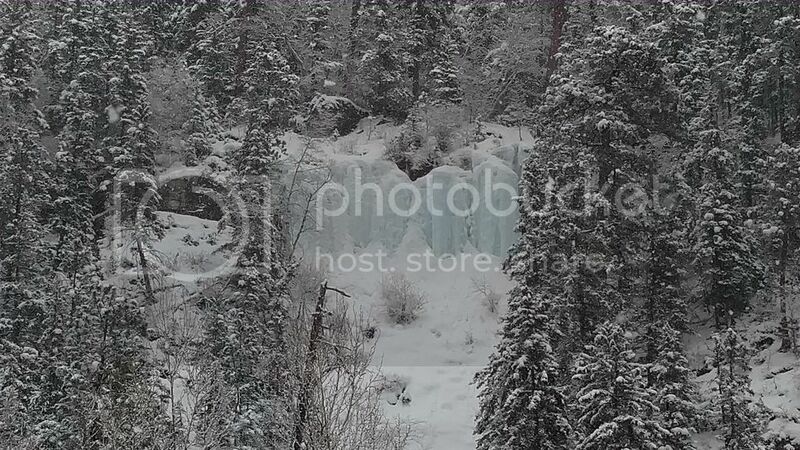 Ended up being iced over, but we had a great hike in (except for the part where I broke through the crust on top of the snow and sank to my waist), saw a bunch of wildlife, including elk and mountain goats. We spent the rest of the afternoon chasing very skittish browns on a small creek at the top end of the canyon, fished a few spots on the way down, and called it a day. 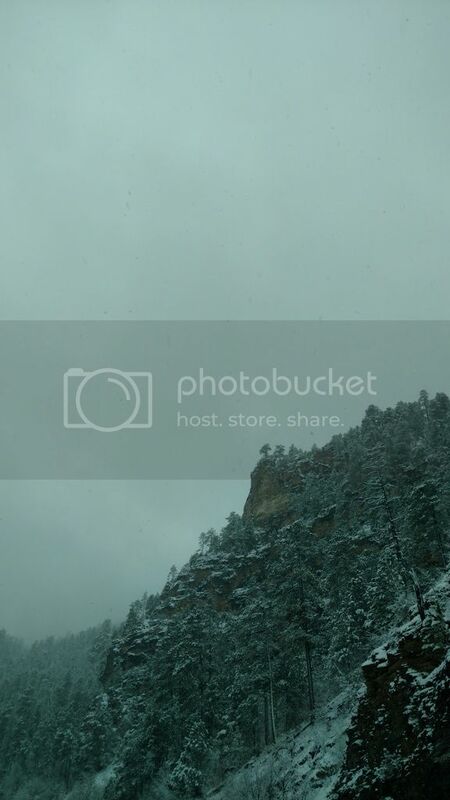 Day three - We woke up to 32 degrees and snow falling, geared up, and headed up the canyon. On the drive up, I told Ethan that even if we didn't catch any fish, it would still be a memorable experience. I had no idea how right I would be. I've had the tremendous good fortune to fish from Maine to New Zealand, 5 Canadian provinces, guided in Alaska, fished I don't even know how many states... But this day was hands down on of the most remarkable and memorable angling experiences I've ever had. 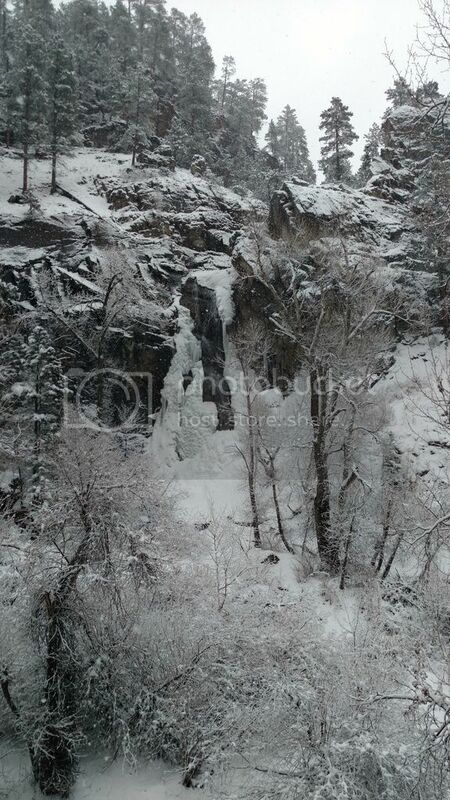 Spearfish Canyon is beautiful under pretty much any circumstances, but with the snow, it was just simply breathtaking. Once we got to the stretch we planned to fish, it didn't take long to get stuck in. 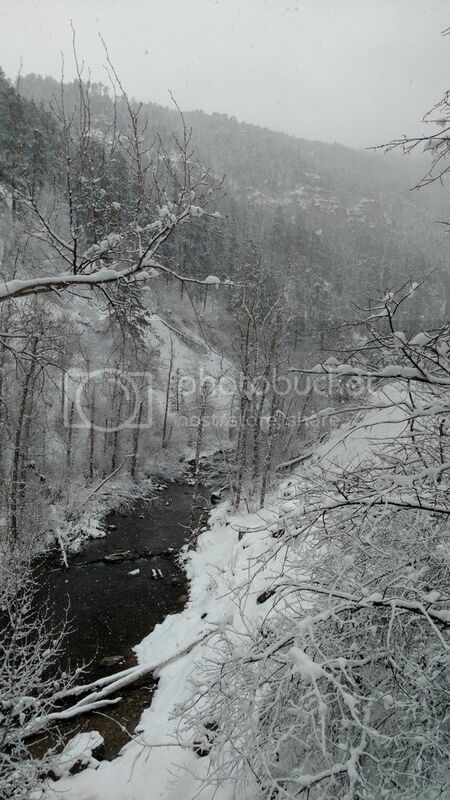 Down along the creek, it was like fishing in a snow globe. No wind, almost no sound other than the water. At times the peaks above us completely disappeared in the snow, and the whole world shrank to nothing but the water, the trees and the snow. Quite a few times, we just stopped, sat on the bank, and took it all in. The past couple days I'd been teaching Ethan how to use a Euro nymph rig, and while he'd been getting the hang of it up to now, detecting strikes was still something of a challenge for him. On day three it clicked. For most of the day, I didn't even bring a rod. I just watched him, coached him a little now and then, and netted fish after fish. At one point, I watched him catch 12 in a row without moving his feet. The section of Spearfish Creek we spent most of the day on (the lower Canyon from roughly Savoy down) is one of the rare areas east of the Rockies where rainbows naturally reproduce, and while it's mostly browns, we did get a few gorgeous wild rainbows. We ended the day fishing a stretch in town, adding another dozen or so browns and a couple rainbows. I lost count of the number of fish we actually caught around mid-afternoon, somewhere in the 30s. When the temp started to dip and the line began to ice up, we called it a day, and headed back to the hotel wet, cold, hungry, and deliriously happy. It was just simply an incredible day. 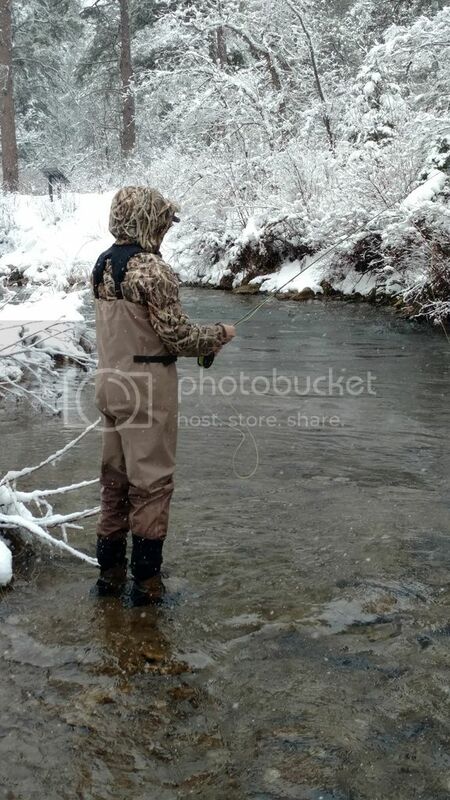 At times, with the snow falling, the near absolute silence and the scenery, and trout after trout coming to the net, it almost seemed surreal. 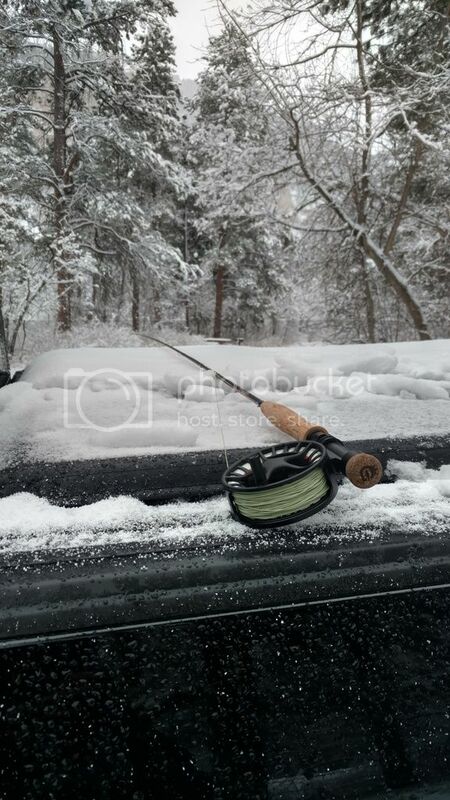 We'd planned on one more morning of fishing the Canyon, but the road up was slick, the wind was bad, and it was pretty cold, so we packed it in, and headed home. Fortunately the snow ended around Rapid City, and we had clear roads the rest of the way back to St Paul. I have no idea how many fish we caught for the trip. Personally, I don't think I actually fished more than an hour total. I was content to be a guide and watch Ethan fish. On the drive home, he was already asking me when our next trip out there would be. 5 users thanked OTC_MN for this useful post. Excellent write up and photos OTC. That is such a beautiful place in the world. I grew up in South Dakota (Fort Pierre to be precise) and I always enjoyed our trips to the Black Hills to see family. 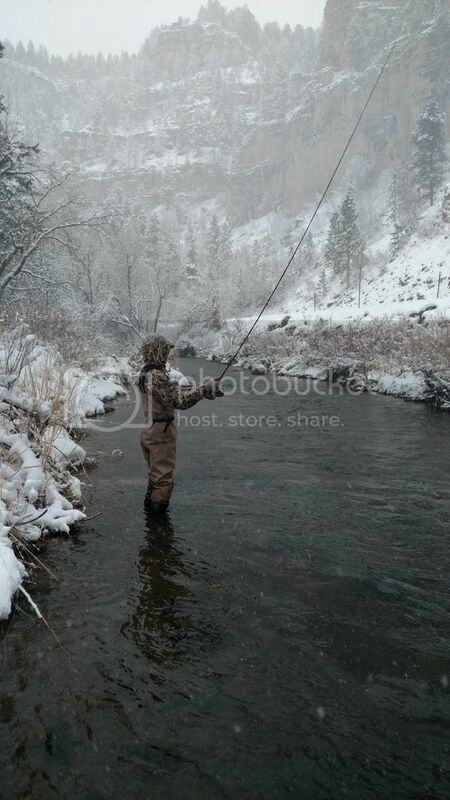 My uncle John is from Rapid City and is a trout fisherman. 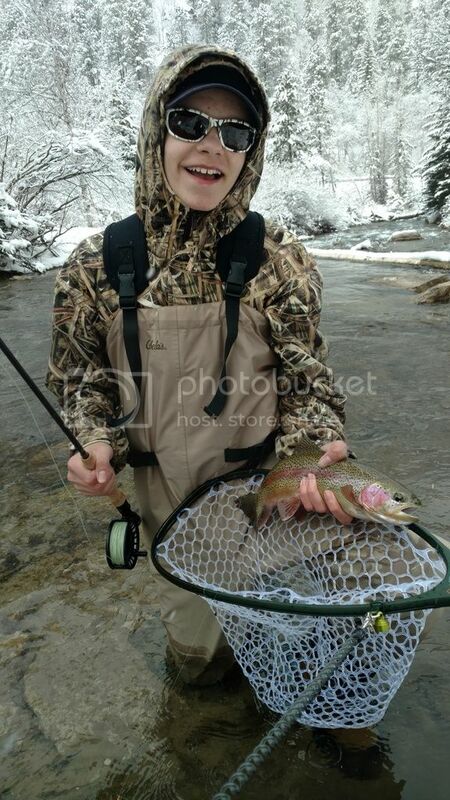 It was/is always a treat to go with him into the streams of the hills to catch trout. 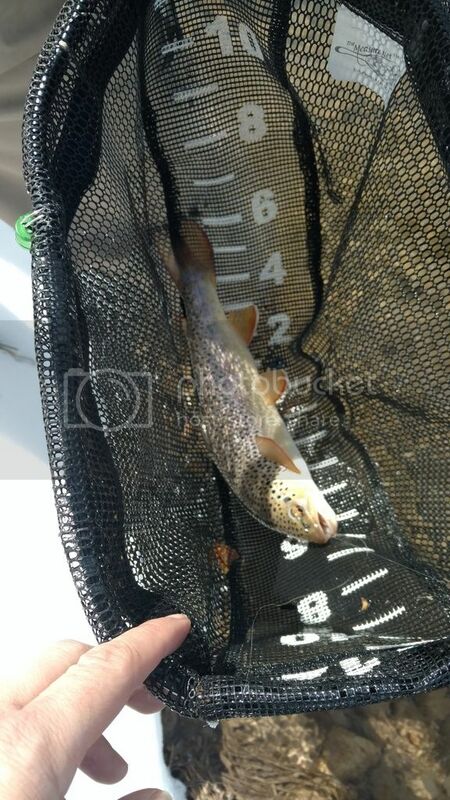 Now that I live in WI, it has been a few years since I've been to SD to fish trout. Your photos and story are motivating me to get another trip to SD on my calendar. My 12yo daughter is now interested in fly fishing. I think I should get her a Tenkara rod to get going. Fishing that way really helps you keep yourself under control and focus on the water and finding fishy looking sections. Winter (spring?!?!) driving in SD is an adventure. I live in La Crosse, my folks in Fort Pierre, and my in-laws in Sioux Falls. We have put many miles on I-90 in the best and worst of conditions. Winter travel in that part of the world is always an adventure. Ft Pierre huh? One of my best friends - the guy I stayed with in Sioux Falls - is actually from Pierre. His dad was a guide on Oahe forever. One of the things I'd hoped to do on this trip was go fish the marina below the dam but the weather didn't cooperate. Tenkara is a great way to get someone started. They can concentrate on putting the fly where it belongs without worrying about managing the line so much. 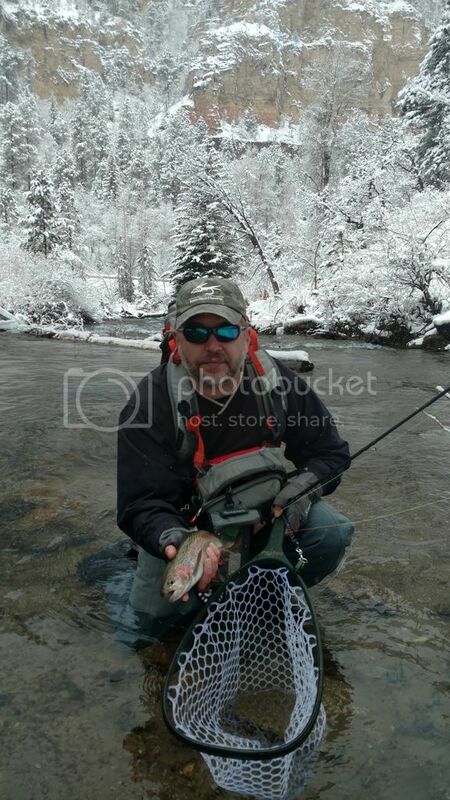 Then when you switch them to a regular fly rod, its fairly easy to just get them to slow down their stroke to cast. Only trouble I had at first was reminding my son he had two hands and he needed to keep his left hand on the line to manage the slack. Tenkara has its limitations for sure, but he's done really well with it the last couple years and it really shortened the learning curve, just because of the simplicity. Plus watching him fight fish with it is a riot. Chances are I know your friend. My dad has been a walleye guide for the past 30+ years. He's 72 now, but still guides a handful of times per year to pay for gas for the summer. There are some big rainbows in the marina and also in the tailrace below the powerhouse. 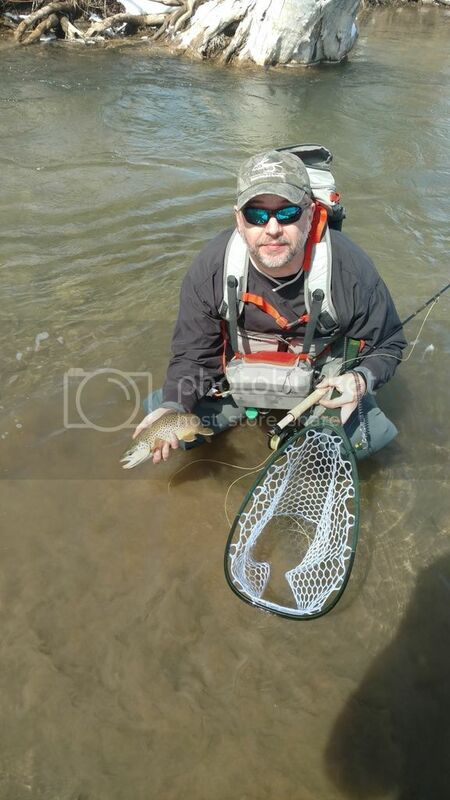 I didn't fly fish when I lived there, so would catch them casting rapalas. Did your dad know Lewie Moore? That marina is a weird deal. Some big fish sometimes tho. Fun thing is if the trout aren't there because it's too warm, it loads up with carp. My friend that lived there was catching carp on a fly rod about 25 years before it was cool.